So, remember that crack dip I posted last week? You know…everyone’s favorite dip…the one that disappears in a flash…the one you always have to triple the recipe for? Well, something strange happened on New Year’s Eve. I found myself, with last minute notice, cooking a ton of food for some people who were coming over. I made way too many dishes and entirely too much of everything. Anyway, there it was…leftover crack dip. A lot of it. An enigma! So I figured the only thing that could make it better is…pasta. Right? because hey, you never know…there may actually be some leftover! Preheat oven to 350 degrees. Place dip in a large bowl and microwave until just heated through, so it can easily be stirred. Add pasta to bowl and stir to combine. Pour mixture into an 8×8 square pan. Sprinkle panko crumbs on top and bake for about 20-25 minutes. This entry was posted in chicken, cream cheese, leftovers, main dishes, pasta, QuickAndEasy. Bookmark the permalink. 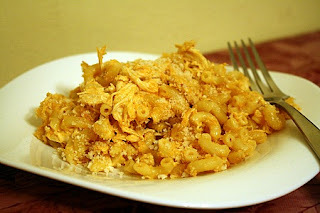 I have been wanting to try the crack dip, as I love buffalo chicken-anything! And adding pasta sounds like an ah-may-zing idea! !